I can't believe I watched her eat her wrap like five times. Feeling creepy now. She really looks great here though. Glad to see her out and about. 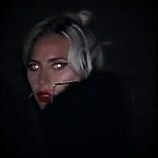 So we have learned that Gaga can drink water, walk, and even have lunch... her talent knows no bounds! Who knows what she might try next! Yes, she’s just like us. She can drink water, walk, and even have lunch 😱 she’s just like us!